Adjusting Instrument: the hand-held instrument delivers a precise and gentle force at just the right angle. 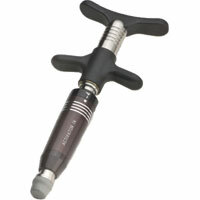 The Adjusting Instrument is a handheld spring-loaded tool that delivers a consistent low-force, high-speed thrust. Because of its low force and gentleness, this tool is very useful for adjusting infants, the elderly, post surgical patients, and those ‘skittish’ of other types of adjusting. This tool is many times faster than adjustments delivered by hand, the body rarely tightens to resist, making adjustments comfortable and effective. It’s also helpful for adjusting elbows, wrists, knees and other joints of the body. Call today for answers to your questions!